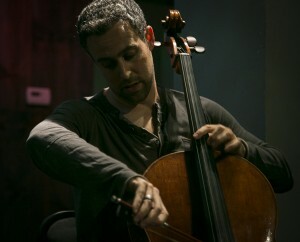 JACOB SZEKELY(cello) Born in Brooklyn New York in 1979, Jacob grew up in a musical family where his talent was recognized early on. Jacob discovered Jazz when he was accepted to study classical cello performance at the prestigious Interlochen Arts Academy, and thereafter began leading a musical double life with traditional classical performance and developing a completely new language on his instrument. By the time Jacob arrived in Los Angeles for his masters degree at USC, he had already launched headlong into his professional career. ANDREA WHITT (Viola), raised in Ohio, began her musical training at age 9 in school orchestras and private study. She also spent eight years performing in the Columbus Symphony Youth Orchestras often serving principal viola and performing solo performances. During her high school summers, Andrea attended Interlochen Arts Camp in Michigan. Andrea completed both a Bachelor’s and Master’s degree in viola performance at the University of Cincinnati College-Conservatory of Music (CCM) under the instruction of Masao Kawasaki and Catharine Carroll. While in school she also performed with several city orchestras around Cincinnati and Columbus. During the summers she studied at the Aspen Music Festival, the Chamber Music Festival of Lucca in Italy, and the Henry Mancini Institute in Los Angeles where she sat principal viola. Jazz was added to her repertoire while an undergraduate, studying under Christian Howes, Brad Goode, Phil Degreg, and Kim Pensyl. She specialized in Brazilian jazz while playing in CCM’s Brazilian jazz combo and she performed alongside Patrick Williams, Joshua Bell, Hillary Hahn, Chris Brubeck, and Johnny Mendel. Her interest in jazz was sparked by many years attending jazz festivals in Michigan with her family. Having moved to Los Angeles in 2007, Andrea performs both classical, jazz and rock, in combos and orchestras alike, including the Los Angeles Master Chorale and her band Jayar. She has appeared in a national commercial for Cricket Wireless and performed alongside Katie Melua on the Jimmy Kimmel Show. In addition to her private students, she also teaches beginning violin students in the LA public schools both during and after school. Besides a musician, Andrea is an accomplished fine arts artist and ceramist, and practices yoga regularly. Recently Andrea launched her own greeting card line titled “Alto Designs.”Â She combines her artistic talents as she explores new musical languages and pathways to inspire passion and curiosity in her students. LUIS MASCARO (violin) is part of a new generation of creative string players, Brazilian violinist Luis Alberto is not afraid of using his solid classical background to explore new musical ideas, techniques, and sounds. Luis was one of the few selected musicians to perform live at the 50th Grammy Awards with the Foo Fighters and John Paul Jones (Led Zeppelin) in the YouTube contest “My Grammy Moment” in 2008, among thousands of video submissions. Being one of the few classical trained violinists in his native country to explore alternative styles and techniques on the violin, Luis begun his studies at the age of 9, becoming the concertmaster of his city’s conservatory youth orchestra at 11. Luis holds a double bachelor degree in violin performance and popular music from Campinas State University (UNICAMP) in Brazil. First string player to graduate from the Popular Music degree at that University, he started more and more to venture in different styles such as jazz and Brazilian music. At that time, his activities included founding the only Brazilian Mahavishnu Orchestra cover band, touring with the Comboio Big Band and playing frequently with Chôro musicians. In 2005 Luis was awarded full scholarship to study at The University of Southern Mississippi, where he had the opportunity to study jazz and improvisation with saxophonist and educator Larry Panella. Luis worked as a Teaching Assistant for the jazz program, teaching improvisation I and II, and coaching the jazz combos as well. After that, he went to study at the University of New Mexico, where he got his MM in violin performance, under the guidance of Dr. Carmelo de los Santos, also on a full assistantship and scholarship award. As a classical musician, Luis has worked and played recitals, solos, and performed with innumerous orchestras in different stages in South America, USA, and Italy with orchestras such as Campinas Symphony, São José dos Campos Symphony, Gulfcoast Symphony, Mississippi Symphony, Meridian Symphony, Mobile Symphony, Santa Fé Pro-­‐ Musica, Baton Rouge Symphony, Las Cruces Symphony, among others. Luis has performed under the direction of great conductors such as Stefano Miceli, Roberto Minczuk, Karl Martin, and world renowned Kurt Masur. Under Masur’s baton, Luis recorded Mahler’s symphony no.1 and Barber’s adagio, in 2005. This solid traditional education combined with his passion for Brazilian Music and Jazz are making Luis Alberto one of the most engaged and original violinists to develop a creative and unique language that combines popular music and violin playing. He is comfortable playing from Brazilian Choro melodies to intricate bebop tunes, going through fusion, progressive rock and many other styles. Luis researches and explores the use of pick-­‐ ups and electric violins, and has a thorough understanding of amplification and the use of effects for string instruments. His recent ventures as a jazz violinist include attending to the 2010 Christian Howes Creative Strings Workshop as a scholarship recipient, performing at BIA, Brazil (Brasil Instrumental Andradas), and being Improvisation faculty at the FIMP, Brazil (Festival Internacional de Musica nos Pampas), and at the Festival Musica nas Montanhas (Brazil). 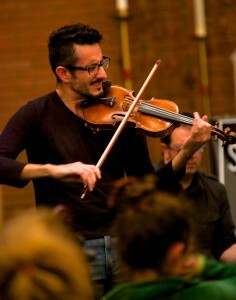 In April, Luis taught a 3-­‐day improvisation-­‐for-­‐strings workshop series at the University of North Dakota. In the Albuquerque and Santa Fé area he has performed with musicians such as Rahim Alhaj, Dave Grusin, and Marcos Cavalcante. Luis is currently living in Los Angeles, CA, and has been recording, performing and teaching workshops in the US and Brazil. THOMAS LEA (viola) is a California native. He received his Bachelor of Music Degree from the San Francisco Conservatory of Music and his Masters in Viola Performance from UCLA. Mr. Lea has been a member and performed with such orchestras as the New World Symphony, Dakah Hiphop Orchestra, and the Oklahoma City Philharmonic. He has also performed with artists such as Yo-Yo Ma, Robert Mann, Donna Summer, Josh Groban, Annie Lennox, Terrence Howard and many more. Thomas works extensively as a Viola/Violin Teacher for the Harmony Project working with both classical and HipHop/Popular Music Youth Orchestras. Mr. Lea has also worked many summers as a Chamber music coach for the Palo Alto Chamber Orchestra. Currently, Mr. Lea’s busy professional career includes session work, arranging, production, and extensive work as a freelance violist.